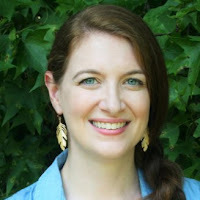 This sweet book revolves around a young girl, Sylvia Rose, and the joy she finds visiting the forest. All the animals enjoy her visits as do the trees. 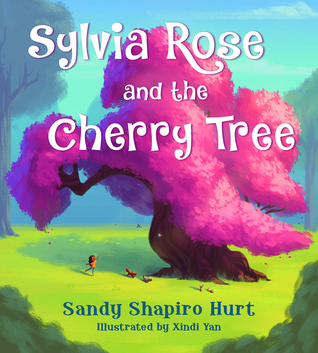 The cherry tree especially enjoys hearing of Sylvia Rose's adventures, but is sad because he can't accompany her and see the world himself. But Sylvia Rose enlists the help of the animals to uproot the tree and take him on a journey to see the world. And while they enjoy their trip and the many sites and sounds they experience, back home, the animals greatly miss the tree and all he offered them in terms of food and shelter. 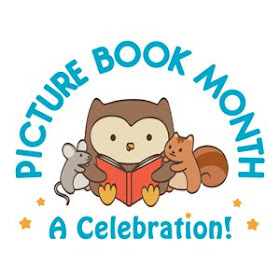 The best part of the book is the lovely illustrations which are bright and colorful and eye-catching. And the themes of friendship, joy in the journey, and the power of home shine through nicely. Annie is excited about giving a presentation for school about what she wants to be when she grows up. Each of her family members is excited as well because they think she's interested in being what they were such as a news reporter like Grandpop. Each family member gives her equipment to use for her presentation representing their own passions. 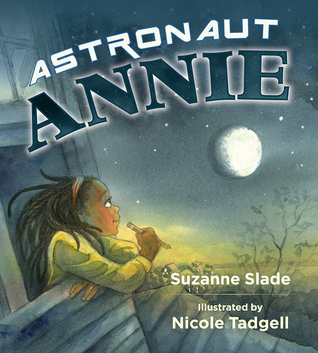 What I especially enjoyed about this book is the creative way that Annie takes what her family gives her and uses it to create her own costume representing her own dream. I wish the title of the book was different though, it would have made the big reveal at the end all the more powerful. The title rather gives away Annie's plans. The story is a fun one about finding your own passions in life. I'm not a huge fan of introducing Shakespeare to children. I had a hard enough time with it in high school. But McDonald does a great job of making Shakespearean drama seem fun and exciting with sword-fighting and insulting going on. Stink is eager to participate when his friend Sophie tells him about the swords and the insulting that will be occurring at Shakespeare camp. He isn't so excited when he discovers that not only is he the only boy, but his rival Riley Rottenberger is attending. But as things get going and he learns about acting, and costumes, he enjoys himself enough to forget about those things. Except when Riley tells him that he's going to be getting a kiss before the week is over. 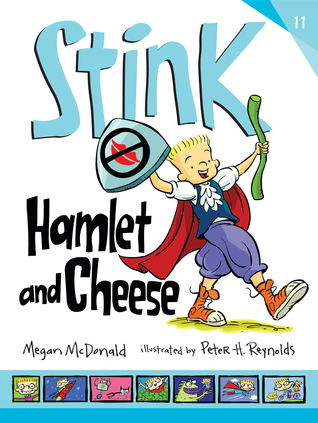 Once again, Megan McDonald has written a winning story about Stink and his everyday troubles and still makes it feel fresh and new. Claude is no ordinary dog he leads an extraordinary life! When Claude spots a film crew on Waggy Avenue, he and Sir Bobblysock cant wait to help behind the scenes. But when the movie loses its stars, the pals are launched onto the big screen! I kinda liked the first Claude book I read, but the ones I've read since then I haven't enjoyed as much. While Claude and his friend Bobblysock are enjoyable enough, the story here made me role my eyes at the stereotypes. The gorgeous blonde heroine who can't help but show her cleavage helplessly waits for the handsome, foolish hero to come rescue her from the big, dark, dangerous gorilla. 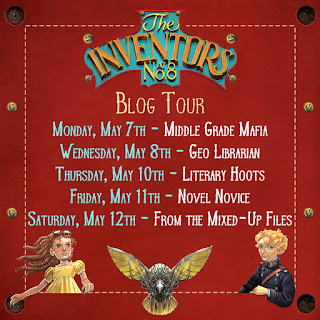 Claude's clumsy attempts to help the show and the impending disaster that the reader senses is coming are the only things that save the book from being downright boring. That's not to say the book isn't going to find readers. Some young readers might enjoy the silliness enough to put up with the foolishness. 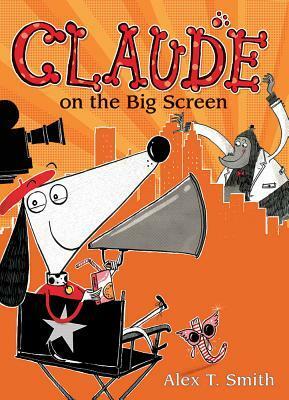 Readers who've enjoyed the other Claude books will probably enjoy it. But I found myself rolling my eyes throughout. 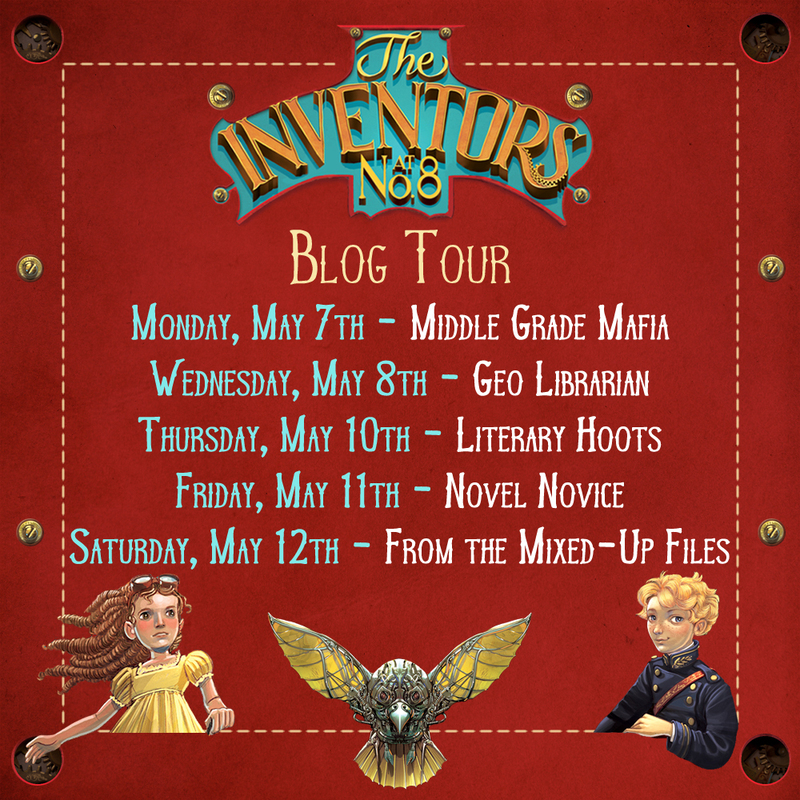 Meet Lucas, the eight year-old prince, and Clara, the daughter of the queen's seamstress. Lucas is an only child who longs to make friends and go on adventures. 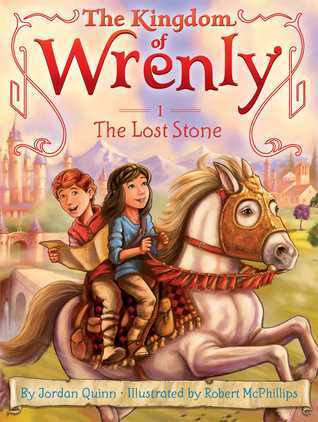 Clara knows the kingdom well, so she and Lucas team up and explore the lands of Wrenly! In The Lost Stone, Lucas and Clara search for Queen Tasha's missing emerald. On their exciting adventure, they travel to all the main attractions of Wrenly: Primlox (the island of fairies), Burth (the island of trolls), Crestwood (the island of dragons), Hobsgrove (the island of wizards), and the beautiful Mermaid's Cove. King Caleb has promised to reward the person who finds the precious stone, and Lucas and Clara are determined to search the entire kingdom until they find it! The Lost Stone is a cute read for young fantasy lovers who aren't ready for the older stuff yet. 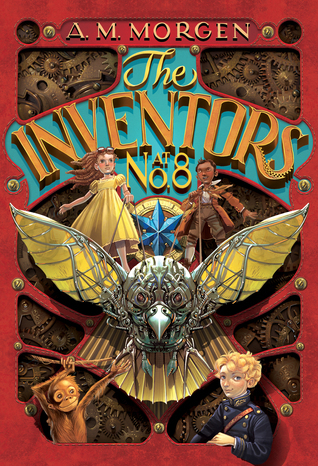 This is the first book in a series of adventures that follows the exploits of Prince Lucas and his best friend, Clara. In this book, Lucas sneaks out of the castle disguised as a village boy so he can attend the local school and hopefully make a real friend. But he is quickly discovered and returned to the palace. Luckily for him, his parents understand his desire for a friend and they allow him to be friends again with Clara. After his mother loses an emerald that she values, Lucas and Clara set out to find it. The illustrations are cute and help move the story along. The text reads smoothly and well, especially for readers new to chapter books. 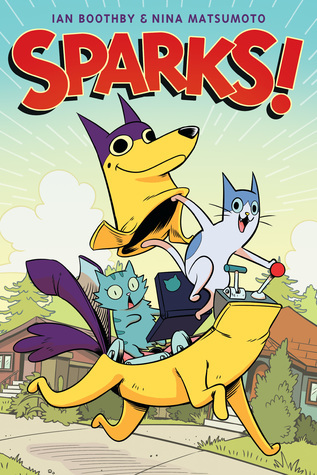 A fun series that I plan to get for my library. Stunning photographs, an eye-catching design, and complete with anecdotes and facts, Urban Gorillas explores the lives of two resident troops of gorillas at the Lincoln Park Zoo. With histories and biographical details for each ape, this book immerses readers in the gorillas' individual personalities while also presenting a fascinating window into their daily routines and care, touching on zoo habitat design and gorilla conservation. This is what narrative nonfiction ought to be: fascinating, beautifully documented, with gorgeous illustrations, maps, and captions. It's clear a lot of work went into this book. Hours of observation, interviews, and photograph taking were used to document the lives of these gorillas. I wasn't too surprised to read in the author's note that the book began as a college class project. I enjoyed reading about Kwan and the other gorillas, their lives and their behavior. I learned a lot about gorillas reading this book. I also found the information about how the gorillas are cared for interesting too. I've long believed that wild animals belong in the wild, but I'm also aware that with so many species endangered, the work that zoos do is important. 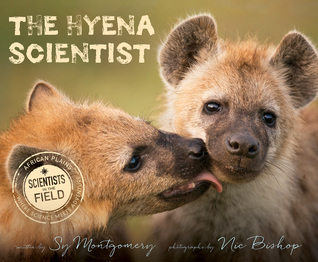 And this book confirmed for me the tremendously important work that zookeepers and researchers do to keep their animals happy while advocating for their wild relatives. All in all a wonderfully informative, and beautifully designed book. Elliot Eisner isn't exactly excited about starting at a brand-new school in a brand-new town; he'd much rather stay at home and read a book. 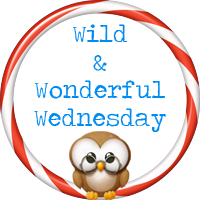 But things take an unexpected turn when he finds out his weird new teacher, Professor Fauna, has planned a field trip for Elliot's very first day. Along with a new friend--brave, outspoken Uchenna Devereaux--Elliot gets caught up in a secret group of adventurers, The Unicorn Rescue Society, whose goal is to protect and defend the world's mythical creatures. Together with Professor Fauna, Elliot and Uchenna must help rescue a Jersey Devil from a duo of conniving, greedy billionaires, the Schmoke Brothers. I'm always on the lookout for fantasy/speculative books for middle grade readers that aren't really long and difficult. Not all readers are ready or able to take on Harry Potter or The Lightning Thief. So I was really interested when I heard about this series. And it didn't disappoint. 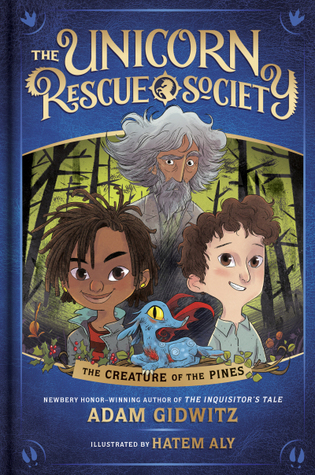 With a couple of fun, but quite different characters combined with an unusual mentor and a delightful mythological creature at the heart of things, The Creature of the Pines works well for younger readers. The story is intriguing from the first when Elliot climbs on the school bus for the field trip on his first day of school and meets Uchenna Devereaux. She's the only person who looks remotely friendly, but her tendency to play musical instruments in the air is a little off putting. But their friendship is really cemented when they venture into the Pine Barrens with their class and stumble across a young Jersey Devil, the last thing they expected to find. And they certainly didn't intend to take the creature on the bus with them or accidentally turn in loose in the middle of the city. Professor Fauna seems to be the only one who can help, but he's a bit unusual himself and downright terrifying at times. 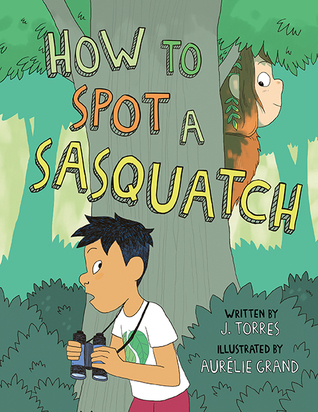 This book makes for a fun read for reluctant readers who need some humor mixed in with their excitement and love the idea of magical creatures existing all around us.